It's been two full weeks and two full days since I started my new Kinder position and I couldn't be happier! Kindergarten is truly its own world, and watching my new little peanuts as they learn each day is simply amazing. Amazing, and a little exhausting: I came home from our Valentine's Day celebration on Friday and fell asleep at 6pm! And while my students have learned my name ("Mrs. Kleins" is close enough!) I have, on multiple occasions, reverted back to my old name and status: Miss Baldini. 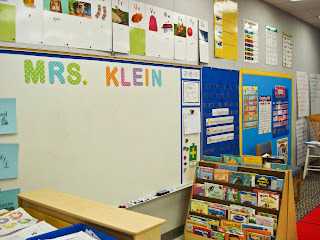 After four year of saying things like: "Miss Baldini is waiting for students who are sitting criss-cross" and "Miss Baldini is so proud of you for being on task", it was hard to switch to: "Great job Mrs. Klein's class." So the "Miss Baldini" phrases slipped out, which were followed by utter confusion: "Who is Miss Baldini? ", "I want to meet Miss Baldini! ", "I don't see Miss Baldini!" Whew! I then had to (try to) explain that I have a new name and an old name, and sometimes I forget (more confusion on their part). To top it off I even accidentally called my new class "Room Q" (my old class name) which is especially funny as my little ones haven't even officially learned this letter yet!